In the past couple of days, my creativity has bubbled out in the form of creating new images from free stock photos. I add a quotation that “moves” me, and BINGO — something nice emerges that I can share. 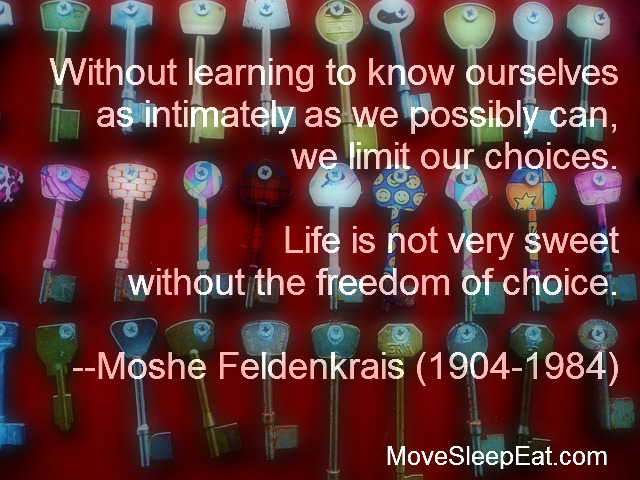 I like this quotation because it resonates with a theme throughout the Feldenkrais Method® — that the ability to make choices is an aspect of our full human-ness. We have choices as we alter habitual patterns in the tiniest movements, to our largest actions. We make choices about how to spend our time. Did you choose to just be quiet and still for a few minutes today? We make a choice to stay on the computer creating images (ahem!) or to shut things down and go to bed. And, we make choices at the grocery store, the restaurant, and in front of the fridge. This free stock photo from pixabay.com really appeals to me. I like the metaphor of the key: keys open doors and treasure chests and hearts, they start cars, they “unlock” concepts and ideas. They also lock to hide, keep safe, or imprison. So many choices! Moshe Feldenkrais knew that we create the reality we experience through the choices we make. That’s some food for thought, right there. As I write this afternoon, I am seated in the sunny kitchen of a beautiful home in York, PA. It is a day away from home, and a day that is far from my routine. Life is full of disruption! Yesterday was a travel day. Up WAAAAAAYYYYY early to get to the airport. 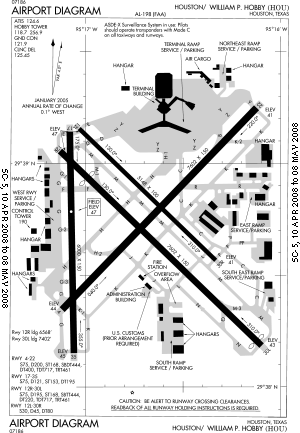 My exercise for the day consisted of schlepping my suitcase and backpack through Houston Hobby, DFW, and BWI airports. Too much sitting to fly, and then to drive, I can tell that I need to MOVE. There is a treadmill in the upstairs bedroom, which I will use later. I’m planning a walk in the neighborhood after dinner. It is what I can do, and it’s the best I can do — so that is the solution for today, and probably for the next few days. Sleep is disrupted as well. I function best on 7.5 hours of sleep each night. My internal alarm clock is reliable. However, two short nights — the night before travel, and then the long settling in process last night in a different bed — and I can tell I am under-slept. Since I am on vacation, there’s the tantalizing possibility of a nap later in the afternoon. I’ll get to bed at a reasonable hour tonight, and perhaps that will hit the internal “reset” button and tomorrow will be better. Since I started following the Eat to Live plan eleven months ago, I have been able to create a food environment at home that is supportive of my health goals. Since I don’t travel for a living, I don’t really have routines and systems set up so that I can eat constructively when I do travel. However, so far I have been able to stick with the plan while I am at my cousin’s home. I had a glass of wine (or two) last night while visiting, and that was my splurge. We’re going out for a family dinner tomorrow after my aunt’s memorial service, and I will probably have another small splurge — a glass of wine, or a bite of dessert. It helps me to tell myself, “It is easy and convenient to stay on this plan, even when I travel. It is easy to make good choices 90% of the time.” If I instead told myself, “This is so hard! How will I ever do it? There are so many temptations!” I would be completely focused on what I don’t want, instead of what I DO want. It is not my intention to say, “Am I not amazing? Look how resilient I am!” However, perhaps people would feel better, stronger, and more in-control of their lives if they would say that to themselves. Humans have survived as a species because we are adaptable to a wide variety of circumstances and environments. Our internal regulatory systems strive to bring us back into balance — homeostasis — so that life systems can continue. Emotional shocks, or threats to the comfortable and familiar, are sometimes less easy to take in stride. Moshe Feldenkrais spoke and wrote extensively about the various adaptations, positive and negative, that individuals devise to “get through” particular situations. To do the best you can with what you have to work with in any moment — that’s the best you can do. Surely, when I remind myself that I do have the capacity for resilience, and I do have the resourcefulness to adapt, each day can be enjoyed for what it is: a gift of opportunity and possibility. This blog and website is the new and public face of the Feldenkrais® Center of Houston. Posts will be varied, with the major interest categories being Moving, Sleeping (or not), and Eating. I want to give you resources and actionable ideas to improve your life. How to move better, sleep better, and eat better. I’m looking forward to the minimalist approach: make things as simple as possible, and no simpler. I think Einstein said that. If you are interested in “the examined life,” or mindfulness in general, I hope you will visit here often. Fruitful digressions will include Awareness, Mindfulness, Compassion, Kindness, Culture, Transformation, the Feldenkrais Method®, Vegetables, and as much silly stuff as I can curate. Do subscribe in your RSS reader, and please sign up for our newsletter. We offer mindfulness-based practices for lasting lifestyle change.